One of the essential areas of Cornwall to visit is the Penwith Peninsula — essentially the glob of land at the very south west of England… You know, Penzance, Lands End etc. So of course we did a day tour down there in our trusty little red car. 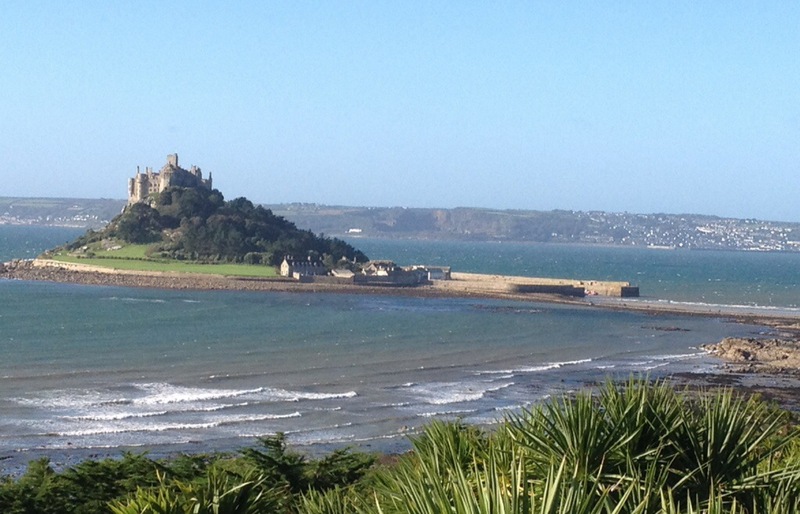 Our first stop was St Michael’s Mount, that distinctive island connected by a causeway to the village of Marazion. We didn’t pay to tour the whole site (chapel and house I think), but we did wander across the causeway and ramble about the quay in the sunlight taking photos. An added bonus was the cafe/kiosk where coffee could be acquired. 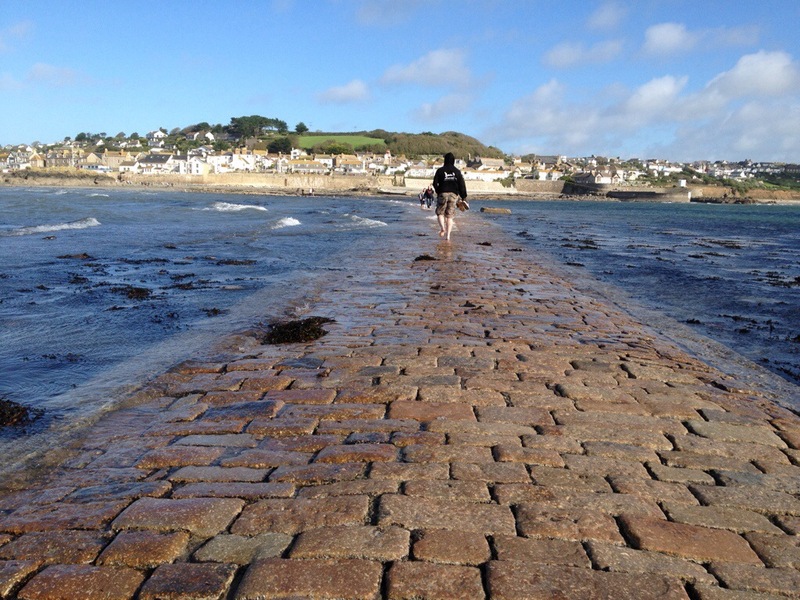 That’s St Michael’s Mount above… When we arrived the tide was out and we happily strode across the causeway — way cool. But we stayed there so long, the tide came in! We had a narrow window of opportunity when we could have taken off our shoes and socks to wade back over… But we missed it due to indecision, and had to pay £2 each to the boat man to convey us back. Oh well. 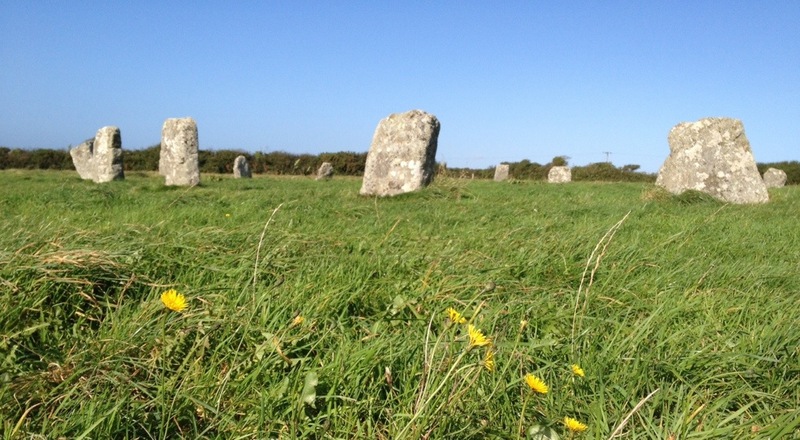 We lunched in Marazion — fabulous fish and chips from the King’s Arms hotel — and then forged our way around the coast, squeezing through the quayside area of Penzance, towards the Merry Maidens — an ancient stone circle beside the road. Beautiful. Despite the tackometer warnings, we headed then to Land’s End. Just because. It’s tourist city, although I confess not as bad as I expected (though for some of my companions it was worse). We grabbed a coffee and took some photos of the sign. Enough said. It was mid to late afternoon by now and we decided to make one last stop before heading back to base. On the way we tried to find the impressive Lanyon Quoit… Actually we did find it, but there didn’t appear to be anywhere to stop, or in fact reach it through the blackberry hedge, so after a couple of drive-bys we abandoned our intention to check it out and photograph it. Disappointing. 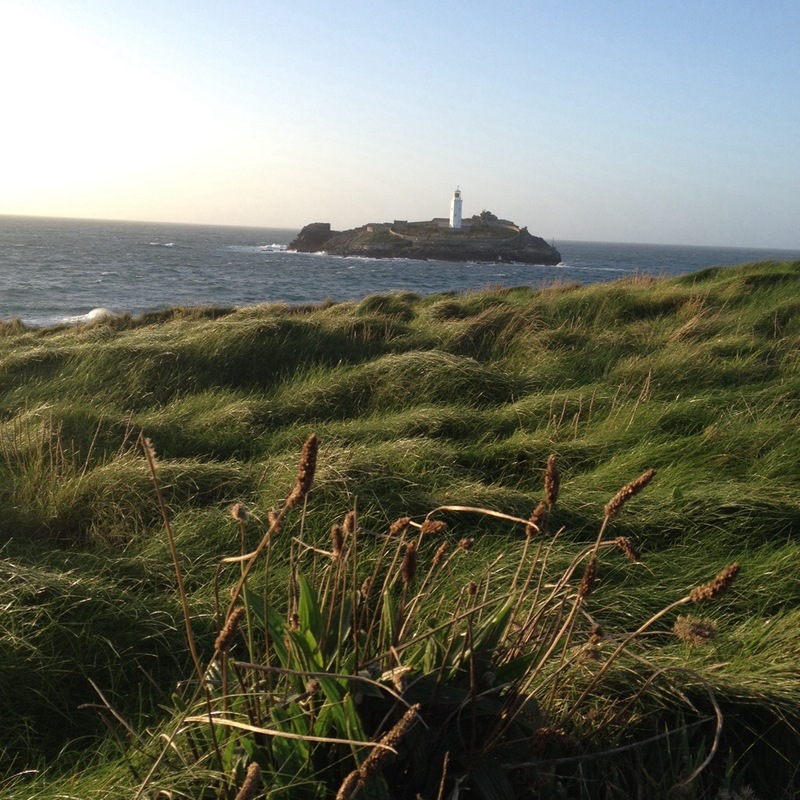 We headed then to St Ives, but changed our mind at the last minute to go check out Godrevy Lighthouse nearby. It was supposedly the inspiration for Virginia Woolf’s To the Lighthouse. I’m sure St Ives would have been lovely at a different time of day, but the lighthouse was perfect in the setting sun. We had a delightful hour or so rambling all over the grassy Godrevy Point, taking many photos of that lighthouse and all the birds. 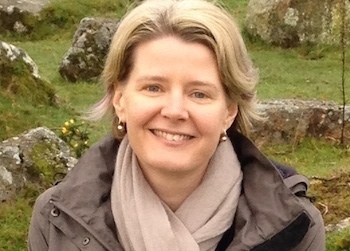 It was a fabulous day, although I would have liked more time to find more ancient monuments and visit St Ives. But as one of my companions said: must save things for next time! That lighthouse picture is amazing. It sounds like you’re having a blast!! Wow! I’m still jealous, even more now that you are not walking in the rain. Enjoy the rest of your adventure. Heh – it’s certainly been a wonderful trip. And we had such great weather in Cornwall!